This blog post assumes the following has been installed on your machine. The resulting project can be found HERE. 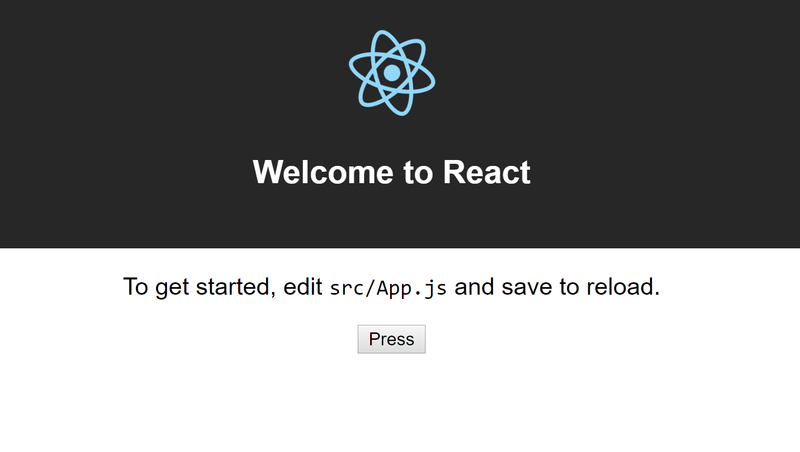 There is a great Github repo “create-react-app”, which can be run using npx. The great thing about npx is that it doesn’t download and install the create-react-app package globally. 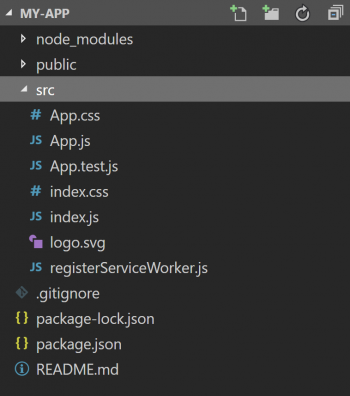 This package is used as a scaffolding tool in order to create the React application. We don’t want it to be there after the application has been created and we always want to create the application with the latest version of the scaffolding tool. See NPX for more features. The application comes with some default functionality and is a good starting point for a TDD approach. 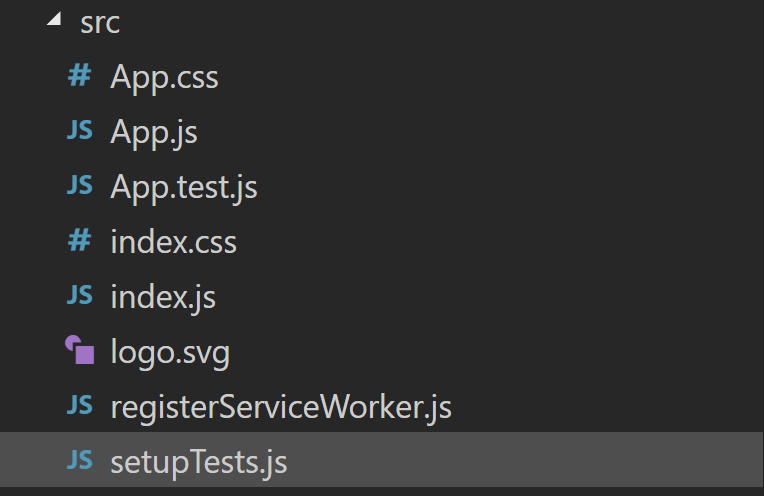 Test files can be both named with the .text or .spec postfix. 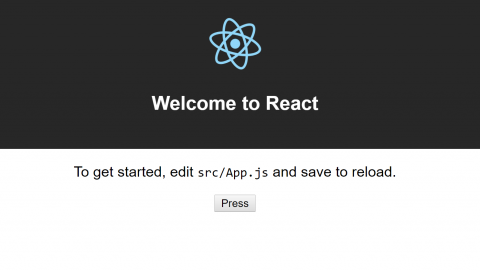 At the top, React is needed as the front end JS library. “ReactDOM” contains methods regarding the DOM that can be used at the top level of a React application. The third import statement makes sure that the “App” component is available for testing. ReactDOM should only be used for functionality, not for testing purposes. I added it because the team from “create react app” includes it in the test file. The general advice is to use React test renderer or Enzyme. The statement from the team on this can be found here. 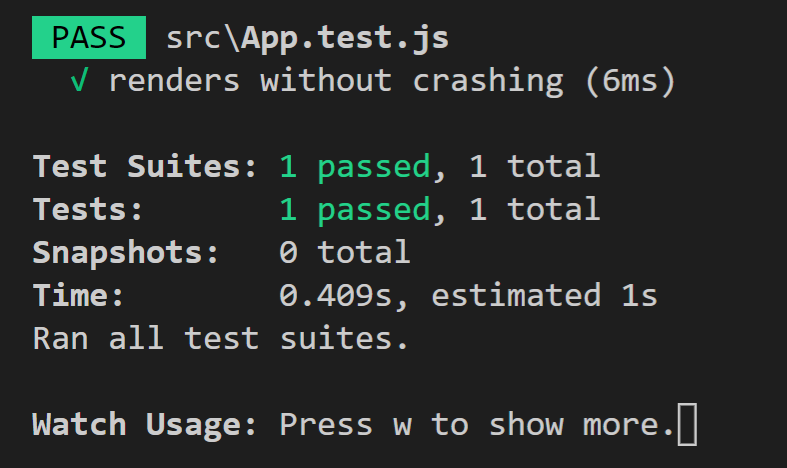 In Visual Studio Code, the Jest extension by Orta is very useful as it shows you (among many other features) which tests have failed inside the test files. Let’s create some unit tests for a simple button. This button should be a React component of which the title can be set. 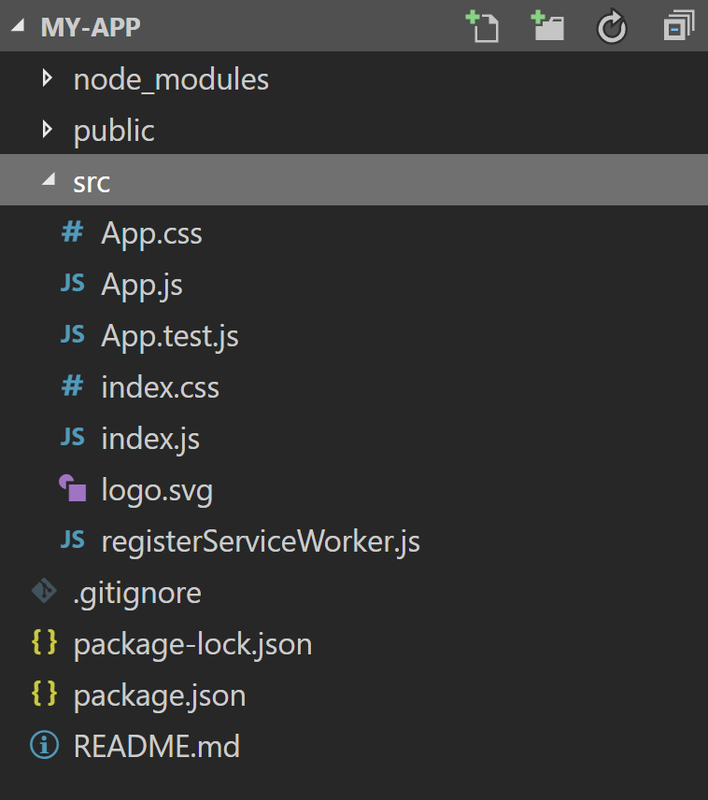 I used this React style guide to set up the folder structure. From the previous section, we know how we can create a smoke test using React Dom. Now, let’s do some shallow testing. Shallow testing is used to test components in isolation. This means that if component A renders HTML, component B, and component C, that we only want to test the HTML. 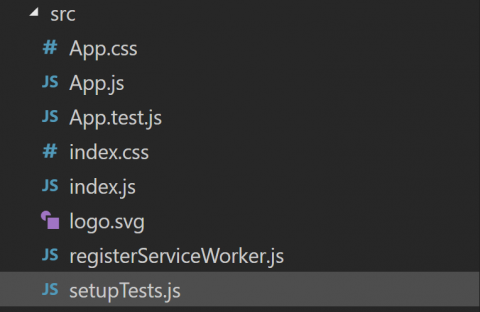 Not the nested components B and C. To test those, there should be shallow tests of those components (B.test.js and C.test.js). As we will see later, integrated component testing is useful when we want to test A, B, and C.
We have to create a new file in order to set up the enzyme React adapter for our project. Enzyme is used to render a shallow of the Button component. This means that if the Button would have other React children components, these would not be fully rendered. Shallow testing is useful to create isolated tests. There is a line in the test report that mentions zero snapshots. In the next section, I will explain snapshot testing. Snapshot testing is a technique that verifies the integrity of rendered components. This means that the output HTML is watched for changes and a warning is displayed if changes are made. When a snapshot test is written, the output HTML is written to a file (a snapshot is taken) and is used as a baseline. After subsequent edits on the component, the edits will be compared against the snapshot file and warnings are displayed if there are differences. The newly rendered button does not match the snapshot anymore and we are notified by this. To demonstrate integrated testing, we want another component to communicate with the Button. 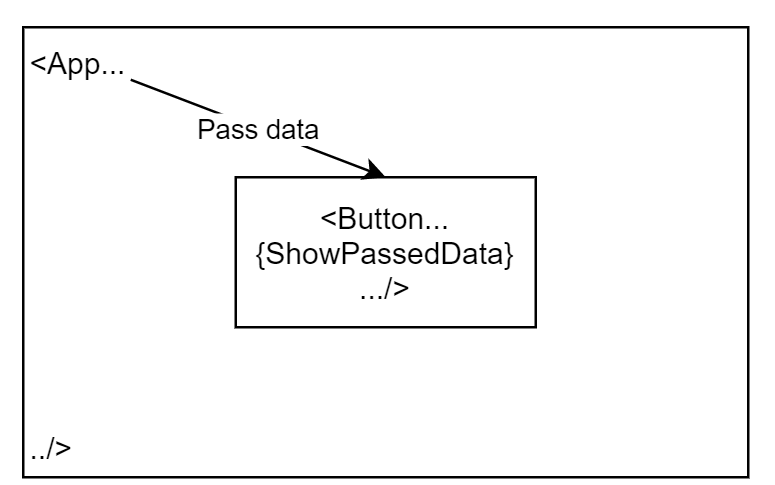 This allows the button to render text passed as a property by another component or (by default) display “OK”. The tests should pass. Notice the “mount” keyword here. As opposed to “shallow” it fully renders the component (including child components). 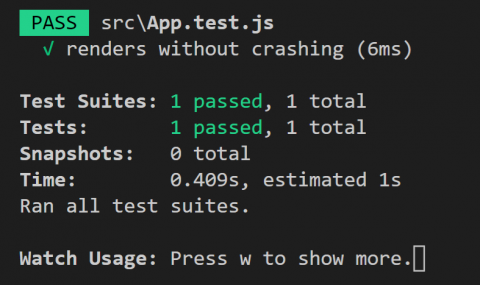 The test will fail so let’s add functionality to App.js that makes it pass. This is a good example of when code coverage does not tell you as much as you would like. The App and Button are covered 100% by one of the three rendering function (ReactDOM, React test renderer or Enzyme mount). This triggers the render function of the component and since this is all code in it, it will report 100%. For me it was confusing to know when to use ReactDOM, the react test renderer and Enzyme. From a TDD with React perspective, the React test renderer and Shallow renderer would have sufficed. I still believe it is good to add Enzyme at an early stage since most projects will be more complex then this example. Having a testing utility ready in advance eases development. I am not sure why the spec file that comes with the create react app uses the ReactDOM. In my opinion it should use the React test renderer or Enzyme (mount). If you would like to have an overview of the ecosystem and increase your web development focus, check out this cool roadmap for 2018. Hey, Riccardo. Great article! Seems like a lot of tutorials nowadays are outdated only because they’re a few weeks old… Yours works just fine (at least for now). The only problem I’m having is with the last test where it passes the text from App to Button. Are you supposed to check for a text somewhere within the entire parent using “wrapper.contains(…)”? Seems like a very broad scope, I mean there could be many more children and one of them could have that text (and it doesn’t even have to be a button).